2012 was a year with grand sporting events. The greatest of them all, the Olympics, took place in London giving us many memorable moments. The opening show was one of the best TV moments of the year. And then the legend (and my favorite vocalist of all time) Freddie Mercury was resurrected during the closing ceremony. It was amazing. Of course, the Olympics brought us some sport as well. There were Bolt, Phelps and Farah, and they all did their part. Earlier that summer Poland and Ukraine hosted the 2012 UEFA European Football (soccer for you across the pond) Championship. This was also a huge sporting event, especially for us Europeans. Spain would eventually be the winner just as they were in 2008. It’s not uncommon for these types of events to make their way onto coins. During 2012 I managed to get 3 coins connected to these events. And here they are! 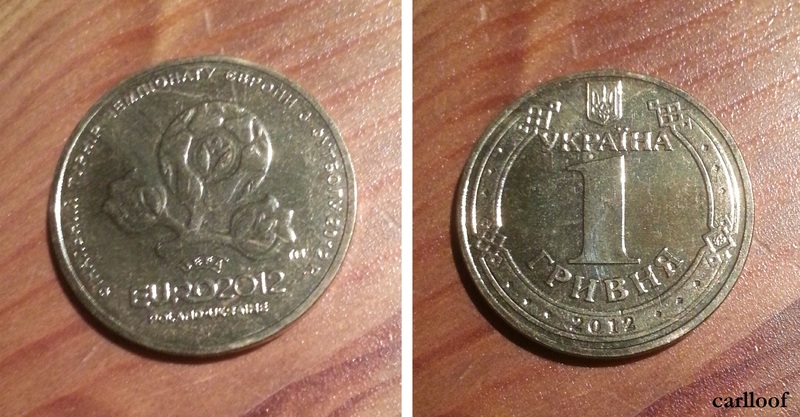 This Ukrainian 1 hrivnja coin was minted the same year as the championships making it extra special. It features the logo of the Euro 2012, a flower consisting of three bulbs – the one in the center is a football and the two on its sides represent Poland and Ukraine (in color: Red & White, Blue & Yellow). By the logo you can also find something very odd and unusual for coins – a trade mark. 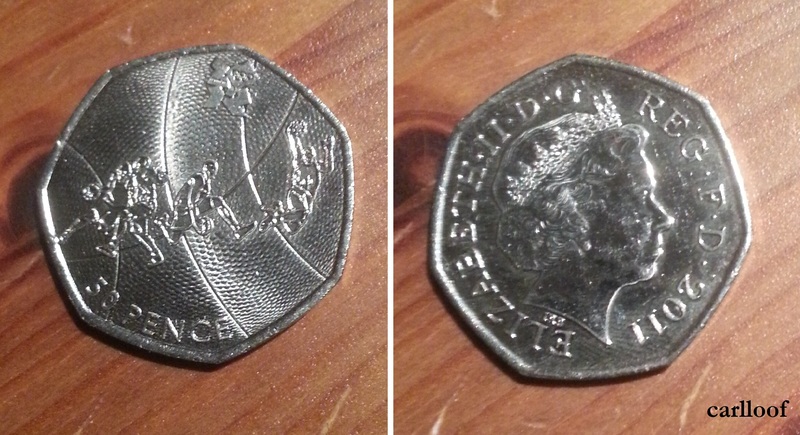 My two 50 pence coins from the United Kingdoms were both minted in 2011, but they’re commemorating the Olympics of 2012. They both feature the tiny logo of those Olympics and they represent one sport each. On the first one you have a man shooting a clay pigeon and the shattered pieces of it. On the other one (which is my favorite) you have the different stages of a basketball dunk. Stripes have been drawn across the coin’s surface and it’s also patterned to look like a basketball. I think that this is a very fun and unique coin!